Students will be introduced to one of the basic elements of art—shape—by analyzing the types of shapes used in various works of art to differentiate between geometric and natural shapes. They will then create their own cut paper collage based on a theme they select. What shapes do you recognize in Beasts of the Sea? Can you find shapes that remind you of playful fish? a floating seahorse? spiral shells? waving seaweed? curvy coral? What about geometric shapes like squares, rectangles, and triangles? Everything has a shape, right? But what exactly is a shape? Shape is a flat area surrounded by edges or an outline. Artists use all kinds of shapes. Geometric shapes are precise and regular, like squares, rectangles, and triangles. They are often found in human-made things, like building and machines while biomorphic shapes are found in nature. These shapes may look like leaves, flowers, clouds—things that grow, flow, and move. The term biomorphic means: life-form (bio=life and morph= form). Biomorphic shapes are often rounded and irregular, unlike most geometric shapes. An artist that loved to explore the possibilities of mixing geometric and biomorphic shapes was Henri Matisse. In the last few decades of his artistic career, he developed a new form of art-making: the paper cut-out. Still immersed in the power of color, he devoted himself to cutting colored papers and arranging them in designs. “Instead of drawing an outline and filling in the color…I am drawing directly in color,” he said. Matisse was drawing with scissors! Matisse enjoyed going to warmer places and liked to watch sunlight shimmering on the sea. He often traveled to seaports along the French Mediterranean, also visiting Italy, North Africa, and Tahiti. Beasts of the Sea is a memory of his visit to the South Seas. In this work of art, Matisse first mixed paint to get all the brilliant colors of the ocean. Then he cut this paper into shapes that reminded him of a tropical sea. 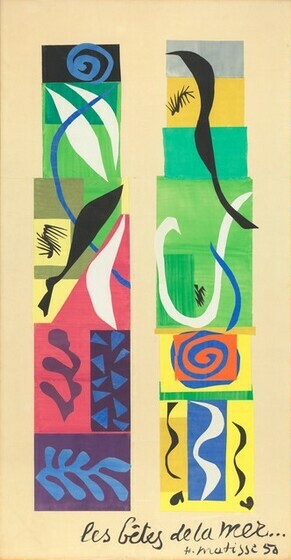 Lastly, he arranged these biomorphic shapes vertically over rectangles of yellows, greens, and purples to suggest the watery depths of the undersea world. 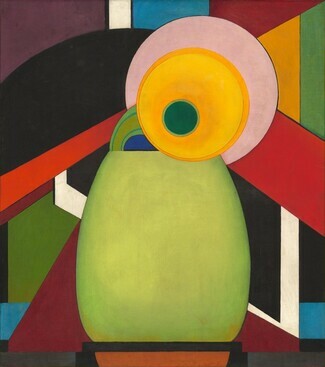 What kind of shapes did the artist use? Point out that this is the same artist as the one that created Beasts of the Sea, however, this one uses paint instead of cut paper. Students will select a theme for their work. Like Matisse, they can choose a memory of a vacation as their inspiration. Also, like Matisse, students will make their own colored paper by painting entire sheets of white paper one color. Use heavy cardstock so the paper doesn’t curl. Using scissors, students will cut the paper into different shapes that remind them of that place. Then, they will arrange their cut-out shapes on a large piece of colored paper. Encourage students to move the pieces around, rotate them, and experiment with layering. When they are satisfied with the design, glue the shapes in place. As an alternative to accommodate motor control differences, the teacher can provide sponges in pre-cut shapes. Students would then dip the sponge shapes into tempera paint and stamp them onto the paper. 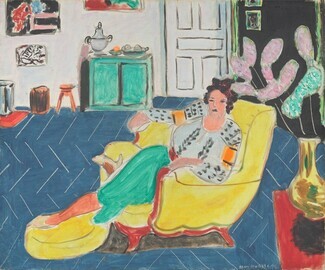 While creating the cut-outs, Matisse hung them on the walls and ceiling of his apartment in Nice, France. “Thanks to my new art, I have a lush garden all around me. And I am never alone,” he said. Have students brainstorm unique ways of hanging their artwork. How could they transform their surroundings? Could a hallway be lined with underwater scenes to make it seem like students are swimming to class? If possible, execute their exhibition desires and invite others students to explore their work. Student artists should describe their process and choice of shapes to convey their theme. VA:Cn10.1.4 Create works of art that reflect community cultural traditions. 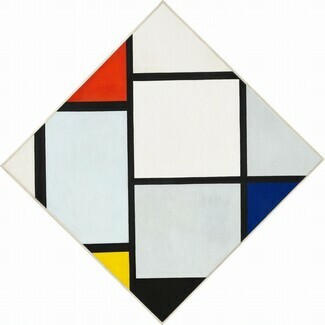 VA:Cr1.1.4 Through observation, infer information about time, place, and culture in which a work of art was created. VA:Cr1.2.2 Brainstorm collaboratively multiple approaches to an art or design problem. VA:Cr2.1.3 Create personally satisfying artwork using a variety of artistic processes and materials. VA:Cr2.2.2 Demonstrate safe procedures for using and cleaning art tools, equipment, and studio spaces. VA:Pr4.1.3 Investigate and discuss possibilities and limitations of spaces, including electronic, for exhibiting artwork. VA:Re7.2.4 Analyze components in visual imagery that convey messages. VA:Re8.1.1 Interpret art by categorizing subject matter and identifying the characteristics of form.